A photo from across the way in Edinburgh, but hopefully the Restricted Roads (20 mph Speed Limit) Bill, inspired by Mark Ruskell MSP, will bring a 20mph default speed limit to all of our towns and cities. In other news, private cars are to be filtered away from Union Street in Glasgow, a consultation for Toryglen, a consultation for all of East Dunbartonshire and some more …. This exciting project funded by the City Deal, will transform the route from Sauchiehall Street along Cambridge Street, past Cowcaddens Subway Station, and under the M8 to St George’s Cross. We had details in the last Digest 22 and all the details are also here on the Glasgow City Council website. Do please submit your support. It’s particularly important that we support active travel measures such as this just now. You will hopefully have seen reports last week, including the GoBike blog on the Glasgow Connectivity Commission Report and we need to add as much of our collective weight to counter those who may be gearing up to oppose active travel measures, despite the benefits these changes will bring to congestion, pollution and safety. We all need to voice our ambition for a healthy, vibrant people-focused city loud and clear. GoBike’s co-convenor Iona, has emailed this message of support, Convenor message of support 231118 to the team at Civic Engineers, in addition to our individual survey responses. The survey is very short so please do get those fingers on the keys to respond. It closes on Sunday. Glasgow City Council is now consulting on the provision of secure cycle parking for residents. The type shown here is what is proposed for tenements, with larger stores for tower blocks. The survey is easy to complete, and even if you personally don’t have the need for such a store, you can still add your support to the general principle of the storage being provided. It is not compulsory to suggest any location on the map at the end of the survey. 1.3 Glasgow City Centre Traffic Management Order Bus Priority, ie Oswald Street and Union Street Bus Gates, closes Friday 21 December. We put all the details of this in Digest 22, Item 1.5. The City Council documents are here: CCTROv24Advert TS-5199-M-000-P-001A_TRO CCTRO(v24) Report Oct2018 CCTRO(v24)_SOR. GoBike supports the general principle of what is proposed but we do have concerns that no cycle provision is included, particularly for Union Street, and the opportunity to improve the contraflow cycle lane on West Nile Street has not been taken. These concerns are contained in our letter to the City Council, GoBike City Centre Bus Priority TRO qualified support 201118 and we hope you will write in along similar lines. Go Bike! kindly responded to the original consultation outlining your support for the proposal. It really helped us get to the point we are now and for the first time since 1936, we are on the cusp of switching to a safer speed limit on streets where we live, work and play. The bill has now moved to the Rural Economy and Connectivity Committee for scrutiny and they have launched their own fresh consultation. This stage of the process is crucially important in ensuring the bill receives the necessary amount of support to allow it to move forward in the Scottish Parliament. MSPs need to understand why the change to a 20 mph default is now needed. Any queries then please do get in touch. Thank you for helping us make our roads safer, cleaner and healthier. It’s a real boost to know the bill has Go Bike’s active support, thanks! In terms of further support, we are encouraging individuals and groups to share their experiences with members of the committee directly as their constituents by email or ideally face to face at a surgery. John Mason (Shettleston) is the only Strathclyde MSP on the committee. Additionally at some point the Scottish Government Cabinet will make a decision about whether to support the Bill or not and you have two pivotal members of the cabinet in Glasgow worth engaging with.. I have also attached a short briefing which has a very supportive quote from council leader Susan Aitken about the bill which may be useful for engaging with SNP MSPs. Many thanks and keep in touch! The short briefing Mark mentions is here: SaferStreetsMSPbrief and you can find details of the Rural Economy and Connectivity Committee here. Richard Lyle, MSP for Uddingston & Bellshill, is also a member as is Jamie Greene, Regional MSP for the West of Scotland. So a whole set of challenges for us all. The easy bit is responding to the survey if you haven’t done so already, but a wee bit more effort is called for if you live in Glasgow Shettleston, Uddingston & Bellshill or the West of Scotland. Mark has asked that you contact your MSP’s who are on the Committee. The third challenge is to contact your local MSP(s) who are Cabinet Members, Nicola Sturgeon (Glasgow Southside), Humza Yousaf (Glasgow Region), Derek Mackay (Renfrewshire North & West) or Aileen Campbell (Clydesdale). Use this tool to find out who your local MSP and from that their contact details, and surgery times and locations are easy to find from the comfort of your own sofa, using your preferred search engine. In our Consultation Extra last week we copied you information from East Dunbartonshire Council about the Local Development Plan drop-in information sessions, starting TODAY. In addition to the drop-in consultation sessions, there is a series of workshops being held, details on the website here. You do have to book for these. Do get involved if you live, work, or travel regularly in East Dunbartonshire. Two weeks ago in Digest 22 item 1.7, we told you about the information sessions being held on 21 November by Urban Roots. They have exciting proposals for encouraging active travel in North Toryglen, with the potential for a green link from park to park across the south side of Glasgow. There’s information, including the outline designs here and there is an on-line form for your comments here. There is no closing date as yet but if you keep an eye on the website they will be adding more information sessions for 2019. Nothing new that we know about, perhaps more in the New Year which is fast approaching. GoBike, Space4PeopleByresRoad and Sustrans have been invited by Glasgow City Council to send two people along to a design session on 20 December. We think the workshop is to do with the design for accommodating cycle traffic on Byres Road and not that an actual bike will be designed, but there will be clarification in the first Digest of 2019, due out on 08 January. GoBike’ new co-convenor, John Donnelly, attended the Cross Party Group on Cycling, Walking and Buses at the Scottish Parliament on Wednesday the 28th November. This was also the first anniversary of the new group being formed so the AGM also took place. A presentation on the Transport Bill currently going through Parliament was provided by officers from Transport Scotland who are responsible for drafting the Bill. (Note: GoBike last alerted you to take action on this Bill in Digest 18 Item 1.2, the Transport Bill Survey and we had earlier in Digest 15, Item 3.1 asked you to take action in response to Living Streets’ call to write to your MSP about pavement parking.) A Commentary on the Evidence Sessions was provided by Transform Scotland. Overall it was agreed that the The biggest fundamental problem is the increase in journeys and therefore traffic, however there were no demand management measures in the Bill. It was highlighted that the best mechanism to get any changes to the bill was to communicate to key MSPs, in particular those in each party with responsibility for the Transport Bill and your local MSP if different. The next meeting will take place in February and will discuss the next steps of the Active Travel Task Force. The GoBike ride of Sunday 02 December took us along the Clyde, criss-crossing over the river at every bridge open to cycle traffic, from the Glasgow Science Centre to the industrial areas of Cambuslang. Along the way we went past the site of many a consultation. We’ve brought you a run down of what we passed. This is the bridge, originally designed as part of the Fastlink Bus Scheme, the north end designed for traffic coming from or going to the city centre, the south end designed for traffic going towards Govan, that has now been opened up to all traffic and all directions. The latest change was one that GoBike opposed. It is a two year trial that will allow taxis into the two lanes on the left of the photo, to share with bikes and buses. You may see the details of our correspondence with Glasgow City Council in Digest 14, the final item, 3.3. “I see that work is going on at Buchanan Wharf and I hope it is proceeding well. You will remember that when we met 3 months ago, 23 August, I expressed concern about the change in surface where the South West City Way crosses from the east side of West Street across to join the exisiting route? Setts are not the best surface for cycling and we would prefer the current smooth surface, although we do understand that you wish to identify the pedestrian and the cycle routes. However, concern has now been expressed about the attached picture that appears to show bollards at this location, and in the cycle lanes. Could you please confirm whether bollards are, in fact, proposed and if so the type and separation? Good practice dictates that bollards are placed at 1.5m separation to allow disabled people to cycle and it does look as if these are closer than that. 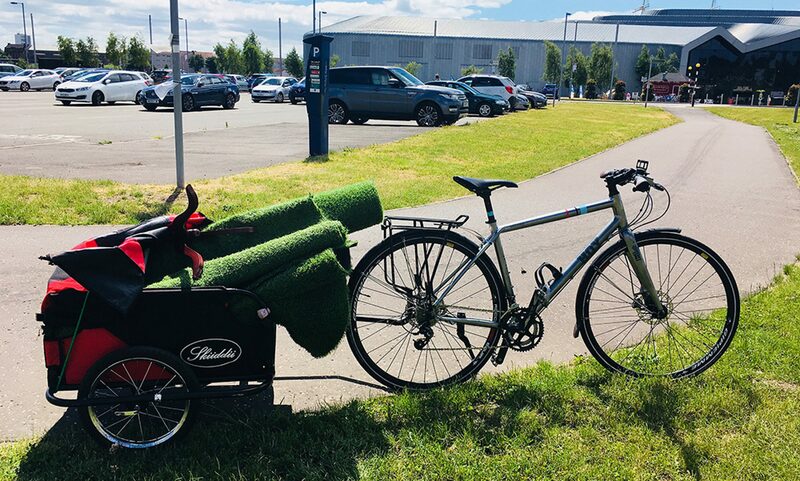 You may be aware that there is a very successful cycle organisation, Free Wheel North based at Glasgow Green who organise led rides, the majority of them using the cycle routes along the Clyde. It would be very disappointing if not only ablebodied people were delayed by bollards but disabled people were prevented from cycling the South West City Way by bollards blocking the way to their larger-than-standard cycles. This was reported in our Digest 19 Item 3.4 and while not a consultation, this news from Glasgow City Council that the quay wall along the Clyde is to be repaired and upgraded see: https://www.glasgow.gov.uk/index.aspx?articleid=23230 supports the work at Buchanan Wharf and elsewhere. As we made our way east, we cycled over the recently reconstructed and reopened Polmadie Bridge. The old bridge had been deemed unsafe, but there were lots of concern when it was demolished that the link from the east end of Glasgow Green to Oatlands would be lost. It was good to see the bridge being rebuilt earlier this year – it’s now technically the newest bridge over the Clyde, and it forms a great active travel link for all the people in the new properties to the south of the Clyde here. Heading on further east, the ride went through the Athletes Village in Dalmarnock, and over the bridge into Cuningar Loop. The connections to this excellent park area are a big disappointment to those of us who want joined up active travel routes. Despite requests, there is no link from the new bridge to the riverside walk/cycle way, and much of the village is separated from the riverside by fencing, thus discouraging active travel for the people who have moved to live here. We feel that this is an opportunity lost, but one that could still be remedied. Before we set off today, our ride leader, Andy Preece, was presented with a GoBike award recognising the excellent work he has done, and continues to do, for us all. During the “dark days” when GoBike had very few members, Andy was the main person who kept the organisation going, managing committee meetings and AGMs, responding to consultations, and all the time using his encyclopaedic knowledge of Glasgow and surrounding areas to develop and lead fascinating rides to look at the conditions for cycling. If you join a GoBike ride (all info regularly updated here) you can guarantee that you will see something you had never seen before and go somewhere you have never been before. Well done Andy! That’s it for now, but we’ll be back in two weeks’ time with more consultation news for you.